Jordan will be releasing a limited retro 10 on the 23rd anniversary of MJ’s return to the NBA. 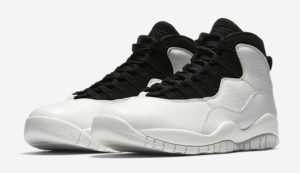 The Jordan 10 Retro “Im Back” looks sharp in a contrasted black and white colorway. The heel pull tabs feature the phrase “I’m Back” and 3.18.95, the day Jordan returned to basketball.